1. There are a couple lessons to be learned in this first one. The obvious one – don’t lie – it’s something that you will regret and/or will come back to haunt you. You can’t go back in time and change your answers in an interview, so prepare yourself with answers you will be proud of. The other lesson is to think about your goals. An interview is a way to determine if you are a good fit for the company & role AND if the company & role is a good fit for you. You’ll want to think about whether the position and company will help you achieve your short and long-term goals before you go into the interview. If they will, then share why when asked about your goals. If not, maybe you shouldn’t accept the interview after all! 2. Yes, you should prepare answers to common interview questions and practice them so you know them well. But don’t memorize answers word for word so that it sounds like you are reading from a script. It’s important that you be yourself and don’t sound like a robot. Also, the person interviewing you may ask a question slightly different from the one you prepared, so listen carefully and take a deep breath before answering – this will give you time to make adjustments to the answer you practiced. Relax & be yourself, if the company wanted a robot, you wouldn’t be asked for an interview. 4. 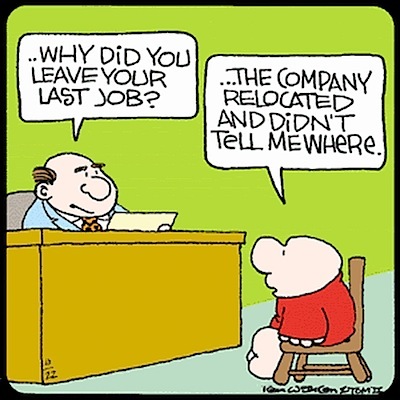 “Why did you leave your last job?” This is a common interview question. Whether you were fired, downsized, laid off or left for your own reasons, this question can be difficult to answer so its a good one to prepare for. Be honest & brief – with this question, less is more. Prepare a sentence, maybe two that describes your reason for leaving. Be very objective and don’t point fingers or dive into a full-blown story. Focus on the bottom-line of your situation. Our friends at Barton Career Advisors share more tips & examples for how to answer this question, here. 5. 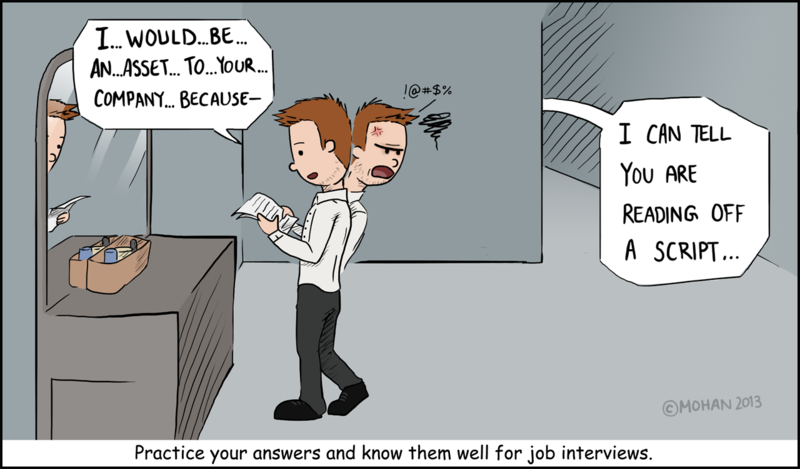 Play along with your interviewer. 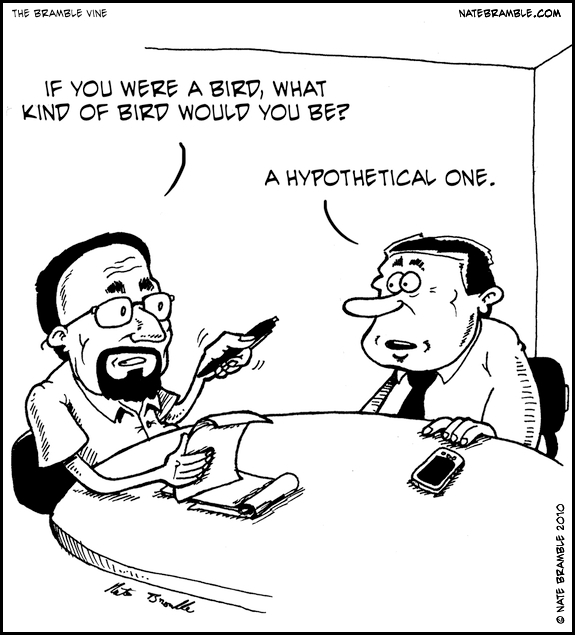 Sometimes HR requires hypothetical questions to see how you think. When asked what kind of bird you think you would be, or what kind of car you could drive if money wasn’t an issue – don’t think about types of birds or cars first. The “why” to your answer is more important than the bird you select. Think about the traits and characteristics you want to tell about yourself. Imagine the question this way, “what are three traits that best represent you?” Then apply those traits to the type of bird, car, or food that makes sense. 6. Prepare answers to questions about your past performance and previous experiences. Behavioral interviewing is a technique used by employers to evaluate a candidate’s experiences and behaviors in order to determine their potential for success. This approach is based on the belief that past performance is the best predictor of future behavior. You may be asked about a time when you made a mistake or to share an example of a time you solved a problem or had to work in a team. There are many behavioral interview questions – have a few good stories in your back pocket that you can use for a variety of these questions. That way you aren’t sitting there trying to remember stories on the spot. I hope these comical lessons help you prepare for your next interview and avoid common interview blunders. Good luck!